This episode is very dense and ends the Pan/Neverland arc and sets up a whole new world of direction. In Storybrooke Pan crushes Felix’s heart because loyalty is a type of love. The ensemble figures out that they need to get the scroll back and a good plan is to switch Henry and Pan so that Henry can just bring it to them however they need the Black Fairy’s wand which the nuns/fairies have, which is in total RPG fashion, you need to get a thing to get another thing to do the thing that completes the quest. So Charming, Hook and Tinkerbell crash the Blue Fairy’s wake to find the wand but that pesky Pan’s Shadow gets in their way. Tinkerbell gets the pixie dust to work so that she can fly up and trap the shadow and then they throw it into a fire which apparently kills the Shadow. This relieves the Blue Fairy and she gives them the Black fairy’s wand. Does this mean Greg is alive and the other people Pan killed by shadow removal? Then it’s Operation get scroll but not before Rumple puts an anti-magic cuff on Pan/Henry, the one Greg and Tamara used on Regina in season 2. Regina does get the scroll but she passes out and turns out the cuff doesn’t work on Pan. Pan does put the cuff on Rumple. Pan then tells Rumple about how being a father was the worst because he couldn’t do the things he wanted and his dreams were crushed, I’m paraphrasing but you get the point. Regina wakes up and knows what she must do to stop the curse but Pan freezes everyone. Rumple then shows up having removed the cuff by cutting off his hand and using magic to reattach it. He grabs Pan and summons his own shadow with the Dark One dagger and stabs himself along with his father. Pan changes back to Malcolm begs Rumple to stop and that they can be a family again but Rumple says that he’s a villain and villain don’t get happy ending. He twists the dagger and they vanish into a burst of light. However there is still the curse approaching. The way to beat it is for Regina to give the one she loves the most i.e Henry which will send everyone else safety back to The Enchanted Forest. She tells Emma she has to go with him because Henry will be alone since he was born in the Land Without Magic, Emma can stay because of her Savior status. Regina offers Emma and Henry good memories of a life they spent together but they will not remember Storybrooke. Emma and Henry drive off as the curse falls. One year later. Emma and Henry are living well in New York City when there is a knock at the door. It’s Hook telling her family is in trouble. He tries the true love’s kiss which fails and Emma kicks him in the rum balls and slams the door in his face. Hello second half of season 3. Very dense epsiode. They were more parts involving the past of a few characters. The most memorable one was Snow White as Mary Margaret giving Henry the book. After that Henry sees her as Snow White which is when it clicked for him the nature and weirdness of Storybrooke. All in all the episode was highly good. Wouldn’t say it was great or a stand out but the setup for the second arc is intriguing. Let’s see if Rumple will stay dead because I will miss him if he does but we’ll have to see. Following from the last episode Emma and Henry are enjoying their lives in New York. Emma’s now has a boyfriend who wants to marry her and Henry’s on broad, there is just one problem, Hook. 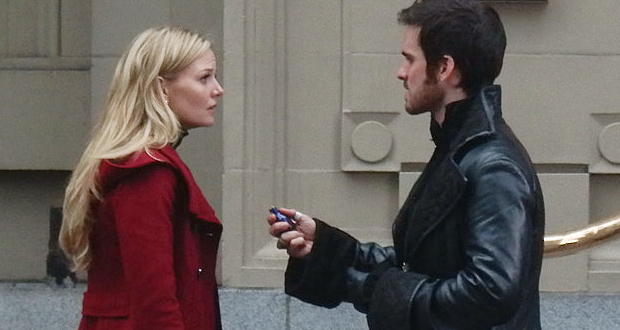 Hook keeps trying to convince Emma that her parents are in trouble and she needs to take a memory potion. Emma thinks he is crazy but she does go Neal’s old apartment at Hook instances. There she finds Henry’s camera he left there a year ago. Emma meets with Hook at central park and gets him arrested. Afterward she gets the photos developed and realizes that the locations and people are unknown to her except her and Henry on in the pictures. Emma posts bail for Hook and he tells her that her good life is a lie and maybe there is guy who loved her in her old life, oh this ship. Emma takes the potion and remembers everything except there was one one portion so non for Henry. Emma goes to tell her boyfriend, Walsh, about how she can’t marry him and her family needs her. Turns out her boyfriend is a freaking flying monkey, I get it, the dating scene is hard sometimes you just have to settle, oh wait, he’s was working for the new villain. 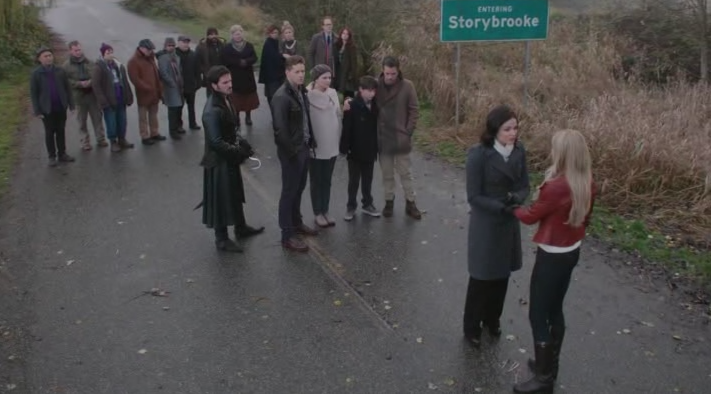 Emma, Henry and Hook go back to Storybrooke. Emma reunites with Charming who remembers her but can’t recall anything about the last year and the only reason they KNOW at least a year has passed is because Snow is pregnant, like she nearly ready to give birth. Over in The Enchanted Forest, Regina is devastated about losing Henry and tries to give up her heart. Snow convinces her not to. Hook also peaces out on everyone because there is no reason for him to stay, he like-likes Emma. Also someone has moved in to Regina/Snow’s castle and they group can’t get through the protection spell. They also get attacked by a flying monkey…geeze, I wonder who this “her” Aurora spoke of??? It’s the Wicked Witch of the West. We are now in OZ territory because Oz the Great and Powerful was a thing. I really enjoyed this episode. Emma got a little annoying with her whole whining about how great her life is but it’s understandable. It was interesting to have less dramatic episode where you can see the character’s life even for a brief moment. The Enchanted Forest storyline wasn’t as great but let’s just see where the Wicked Witch plot goes, not really looking forward to it but maybe we’ll see what they do with the character.